Name: Avalanti Acrylic Modern Freestanding Soaking Bathtub 67"
Avalanti Modern Bathtub - Freestanding Bathtub - Soaking Tub 67"
Transform your bathroom into your own personal spa retreat with the Avalanti acrylic modern bathtub. 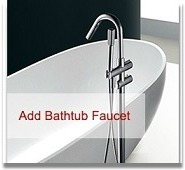 This chic bathtub boasts a warm and inviting polished satin finish. The Acrylic Modern bathtub is very strong and durable. With its silky velvet touch and traditional craftsmanship, the Avalanti acrylic modern bathtub will undoubtedly enhance your bathing experience while contributing to an overall state of serenity and luxury.